Happy Monday, everyone! With a few exciting updates and items to share, I thought I’d write a post that captures it all. Today’s post is all about my Monday Morning Thoughts. I’m incredibly excited to announce my new Vine Business Quotes Initiative. 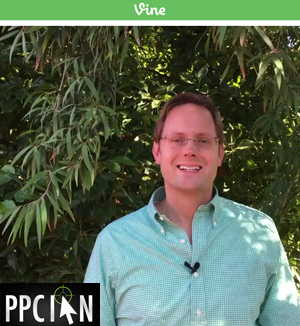 Based on the popularity of my marketing, business, and investing quotes in social media, I thought it would be really fun to share my quotes as short video clips on Vine. (I’m also sharing them on My Instagram too.) Please head on over and let me know what you think. My good friend and industry leader, Marc Poirier, is raising money for Make-A-Wish Quebec. Marc and his team at Acquisio have participated in the 48-Hour Ride for many years and have raised a substantial amount of money and awareness for these children in need. Let’s help Marc make this the biggest and best year ever! I wanted to take this opportunity to highlight a true leader in our industry, someone who has gone above-and-beyond for his community. Please join me in donating and wishing Marc a successful 48-Hour ride. As a digital marketing community, let’s give back by supporting Marc and the Acquisio team! My PPC Ian Facebook Page recently surpassed 50,000 fans, and I’m now about to surpass 60,000. I wanted to sincerely thank everyone for their support, it means the world to me. I’m incredibly focused on video marketing these days. My Vine quote initiative (#1 above) is a direct offshoot of my passion and interest in video marketing. I’m also revamping my PPC Ian YouTube Channel. Make sure to check out my new introduction video, and subscribe to see all of the great videos I have forthcoming. Having purchased some cost effective video equipment and learned the basics of iMovie, I look forward to sharing with you my video marketing journey in the coming weeks. Sure, I have executed amazing video marketing at the corporate level, with the support of large teams and large resources. However, it’s completely different when you design, shoot, edit, publish, and market video 100% yourself. As a scrappy marketer, I want to learn everything I can about video, without the support of corporate resources. Also on the topic of video marketing, my team and I have been breaking boundaries in the commercial real estate industry with some of the first ever drone videos of self storage facilities. I look forward to sharing with you my experience in the coming months via an interview with my very own drone videographer. At the corporate level, I have been executing upon some amazing hyper local blogging initiatives. With a multitude of blogs to manage, problems of scale quickly arise. As an overall framework, I have been challenging my team to focus on quality over quantity. In fact, I don’t want to publish a single post unless it marks the best work of the writer’s career. A challenge to everyone reading: Do the best work of your career in everything you do. Make a name for yourself. I’m an investor and marketer. While most of you know me as a marketer, I’m more investor than marketer since the investing framework fuels everything I do in marketing and most other areas of my life. I’m truly thrilled that my friend Jason Fieber launched his new blog, Mr. Free at 33. An incredible blogger, Jason writes about investing, dividends, saving money, and achieving financial freedom. His message is a powerful one, and I encourage you to check out his blog. Lately, I have been checking stats too frequently. With instant access to so many numbers, I have been checking the numbers an absurd number of times throughout the day. My advice for the week (both for myself and everyone reading): Focus on your work, and refrain from checking your stats too frequently. The act of checking stats can be fun and rewarding (if you catch issues). Most of the time, however, it is a huge distraction from completing actual work. I wish each and every one of you an incredible week and thanks for reading. Looks like you’re doing some amazing things in life. That’s fantastic. Every day is an opportunity to improve ourselves and the world around us. You are truly welcome. Thank you for the kind words as well, it means the world to me. Wishing you all the best! Very glad to see you have over 50 000 Facebook fans, I haven’t yet to start my facebook page. Keep it up. Like you, I often check my stats. I couldn’t stop the habit. Initially, I thought I am getting motivate when I see growth, but now I realize it takes too much of my time. I need to find a way to stop doing that. I am also very excited that Jason Fieber is back with his new blog. He inspire thousands of people. “Do the best work of your career in everything you do. Make a name for yourself.” “Focus on your work, and refrain from checking your stats too frequently.” This will help me to improve more on myself.